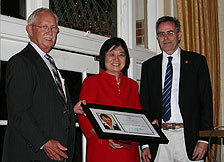 LONG BEACH, CA (Laserfiche) April 8, 2009—President and CEO Nien-Ling Wacker of Laserfiche, a leading provider of enterprise content management (ECM) software, was presented with the Distinguished Alumnus Award from the University of Southern California (USC) Department of Chemistry last night for her entrepreneurial career. The 37th Annual evening ceremony recognized students, faculty, and alumni for their excellence in undergraduate studies and graduate research and work. 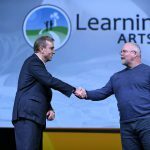 In 1987, Mrs. Wacker founded Laserfiche, and under her leadership, the company has undergone perpetual transformation, becoming an innovative, independent software company serving more than 25,000 organizations—including Fortune 1000, government offices, healthcare, financial, and higher education. Dean Kenneth L. Servis, Professor of Chemistry; Nien-Ling Wacker, Laserfiche CEO; Chair Charles E. McKenna, Ph.D. Currently, 11 USC departments use Laserfiche for their document management needs, including the USC Provost Office, Marshall School of Business, Keck School of Medicine, Career and Protective Services, and Facility Management. Mrs. Wacker, a native of Shanghai, China holds a Bachelor of Science degree in physics from the University of Melbourne, Australia and a Master of Science degree in chemistry from the University of Southern California. She is a frequent speaker and contributor to international conferences and seminars. Laserfiche® creates simple and elegant enterprise content management solutions that help organizations run smarter. Laserfiche® offers a suite of products and services that address enterprise-wide challenges from the perspective of executives, records managers, IT staff members, and end-users. 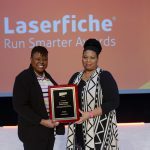 Since 1987, more than 25,000 organizations—including government offices, Fortune 1000 companies, healthcare and financial organizations, and higher education—have used Laserfiche software to meet these challenges, improve productivity, and enhance data security. By digitizing paper archives, Laserfiche enables users to instantly pinpoint the information they need. Secure Web access allows firms to share information with remote offices, business partners and clients, while comprehensive security options ensure compliance with government- and industry-mandated standards. Laserfiche customers include all branches of the United States military, the Secret Service, United States Congress and the State Department. Local Laserfiche clients include: Long Beach City College, CSU Chancellors Office, Molina Healthcare, and Farmers and Merchants Bank.